The Weidner & Raupp Families of Buffalo Grove, Lake County, Illinois - John Weidner Sr.
John Weidner. Courtesy of Solemn blessing & dedication of St. Mary's School, Buffalo Grove, Illinois; By His Eminence Samuel Alphonsus Cardinal Stritch, Cardinal Archbishop of Chicago, October 5, 1947; On the Hundredth Anniversary of the First Holy Mass in Buffalo Grove, Illinois, Celebrated by the Reverend John H. Fortmann, Pastor, St. Joseph's Church, Gross Point, ILL. in the Fall of 1847. [S7] St. Mary Catholic Church, St. Mary's School Dedication, 136, 138, 140, 142, 146. [S1] Letter, Dr. Josef Urban to John Joseph Weidner, 22 Jul 1996. [S2] Letter, Dr. Joseph Urban to John Joseph Weidner, 11 Sep 1996. 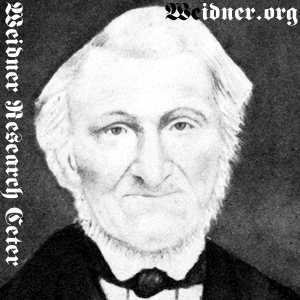 [S11] John J. Weidner, Compiled Birth, Death, 624 shows birth year of 1799. [S405] The Cemetery Committee, Vernon Township Cemetery Inscriptions, Lake County, Illinois, 101 date only. [S11] John J. Weidner, Compiled Birth, Death, 624 date only. [S11] John J. Weidner, Compiled Birth, Death, 612, 613. [S7] St. Mary Catholic Church, St. Mary's School Dedication, 136, 138. [S11] John J. Weidner, Compiled Birth, Death, 623. [S7] St. Mary Catholic Church, St. Mary's School Dedication, 136, 142. [S535] 05 Jul 1860 1860 U. S. Census, Arlington Heights, Cook County, Illinois, USA, Wheeling Township, page 151, dwelling 1061, family 1022.